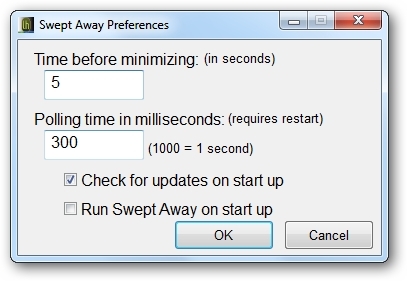 Swept Away is a free tool that automatically minimizes inactive windows after an interval of time that you can set. Just install the tool and run it. It will then sit in system tray and automatically minimize all inactive windows after 300 seconds. To change this interval of time double-click on its icon, type your desired time in the Time before minimizing textbox and click OK. If you want the tool to run everytime Windows starts then select Run Swept Away on start up and click OK.